Although some firms consider hiring a chief content officer (CCO) a best-practice, it turns out that bringing an executive on board at that level hasn’t been realistic at most companies. Most B2B organizations (other than publishing, communications, and media companies or agencies) don’t have a person with chief content officer title who has a seat at the CEO’s table. Let’s be clear: Content marketing works. It consists of non-egocentric (i.e., end-user-focused rather than product- or company-focused) content that helps buyers with their jobs and careers, along with the more traditional product-centric content vendors have historically created. Marketers are seeing the positive impact of their content marketing across the entire buyer’s journey, from awareness-building to demand creation and sales enablement. The proof of the business case for content marketing is that 74% of marketers indicate that their company’s content marketing investment results in an increase in lead quality and quantity. After all, marketing automation, account-based marketing, and sales enablement, absent content, are like a car without gas. Content is needed for everything from a website, to email campaigns, to even pay-per-click landing page offers. If not for content, many of marketing automation’s key components cease to function. Drip campaigns come to a halt if there is no content to drip to leads. Lead scoring stops without content for a lead to browse on a site. With no content, many demand generation campaigns come to a halt because there are no enticing offers for lead-capture landing pages. CMOs understand that high-quality, relevant content is a must-have. Establishing a content strategyis at the top of their priority list. However, though many say they have “a” content strategy, a cohesive, well-documented content strategy continues to elude many organizations—63% of them, according to MarketingProfs and CMI. And although content marketing works even without a strategy, it works much more effectively with a strategy—and even more so when that strategy is documented. 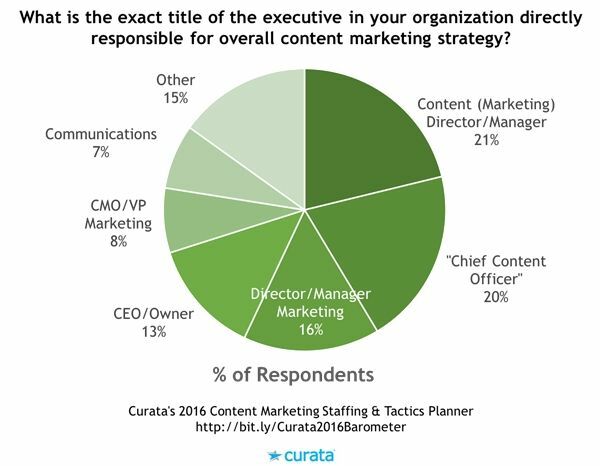 Who’s Going to Lead Content Marketing? Developing and driving the content strategy that CMOs desire require that an executive be in charge. That organizational need has been spoken about by thought leaders and consultants for years. And having that lead in place is certainly one of the indicators of a high-performing marketing team. Absent an advocate at the senior-management level, companies under-invest in content marketing, which then ends up being performed in an ad hoc fashion by disparate groups of people in departments or units such as product marketing, social media, demand generation, and public relations. The resulting content, though better than no content at all, is invariably egocentric, inconsistent in messaging, and less effective. That leaves a tremendous amount of opportunity on the table. 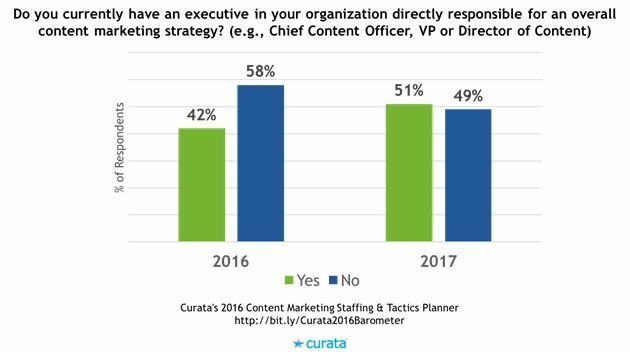 Of the companies Curata surveyed, 53% of the content marketing leaders have an executive in charge of content marketing today, versus 32% of the laggards. Companies that lack an executive in charge of content marketing need to start with a content audit, and then seriously assess whether the salary savings outweigh the wasted content produced, good content underutilized, and foregone leads and resultant revenue missed. In other words, they need to figure out their content marketing ROI. However, the roles and responsibilities of a content marketing lead have shifted. Once it was thought a best-practice to hire a CCO to drive strategy and change across the organization, overseeing a team of content creators to enable the future success of a digital, inbound marketing-focused organization. Establishing a CCO would provide the authority and oversight needed, it was thought, bridging the gap between marketing functional areas and related processes for content production, promotion, and analysis. It hasn’t happened. Yet. And as much as this role may be needed to revolutionize how marketing teams approach content, to date it simply hasn’t been practical for most companies to bring an executive at this level on board. Especially since many teams across a marketing organization were already creating plenty of content—albeit not the new, non-egocentric “content 2.0” required to engage the well-informed buyer. A more popular approach has been to bring on board someone with slightly less authority (and associated cost)—a VP or director of content marketing, with responsibility for developing and orchestrating a content strategy, hiring, and running the daily production schedule, but without reporting to the board. Some 37% of content marketing executives have one of those two titles. Most people titled chief content officer are in agencies or media/publishing companies, or they carry the responsibilities of CCO without the exact title. Even among the largest companies with content marketing teams—those with $1 billion or more in revenue—51% have three or fewer people in their team. Core content marketing team members tend to be content creators/writers, content curators (content curation is a highly efficient and effective way to charge your content engine), designers, and content generalists. 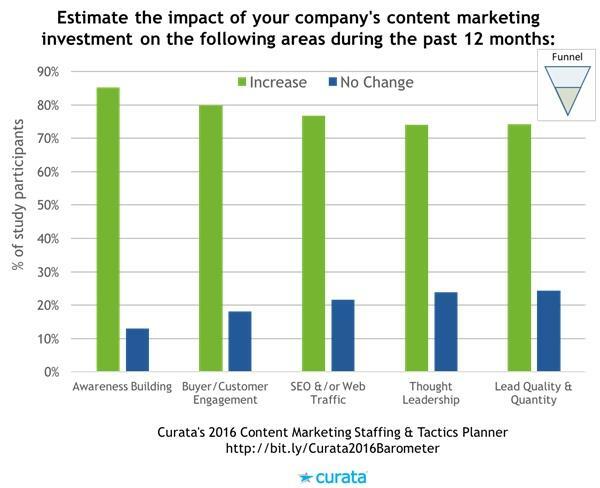 Although the best content marketing teams at larger companies already look after strategy and orchestration, there will still be significant expansion of these teams as companies continue to prioritize content marketing to support demand creation, sales enablement, and account-based marketing. 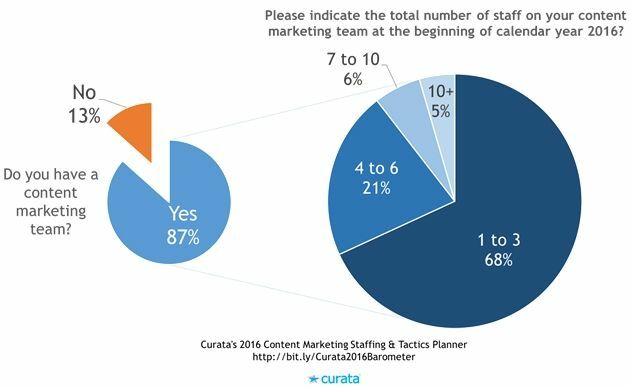 Fully 43% of companies in Curata’s survey are increasing their content marketing staffing levels. Companies should consider adding to their content marketing teams include, per Ann Handley’s formulation of a content marketing team: someone to lead strategy; an editorial director; content producers/creators (journalists are increasingly popular for content marketing roles); graphic/Web designers; an analytics expert; a marketing operations manager to run software tools such as Marketo, Eloqua, Pardot; and a website manager to maintain your blog/site. As companies increase the size of their content marketing teams, the first question will be, “What types of staff should we hire?” To address that question, our study participants were asked about the most important skill sets missing from their content marketing team. 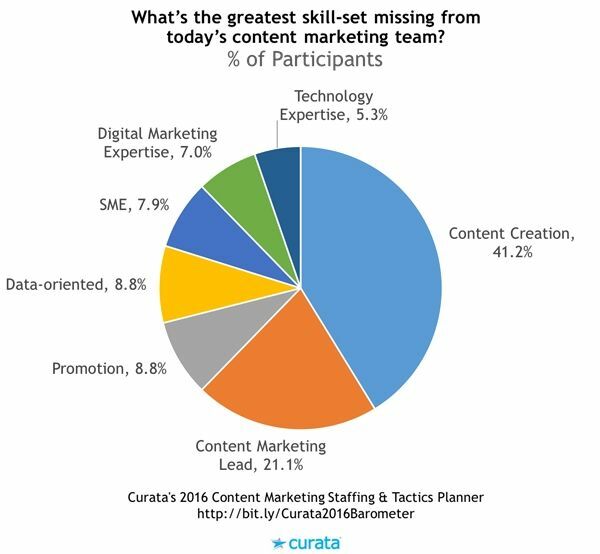 And it’s no surprise that content creation is the top skill needed in today’s content marketing team, per 41.2% of participants. Experienced marketers who are used to creating product and company-centric marketing copy do not often have the skills needed to research and write creative, insightful, entertaining, non-product or non-company-centric copy. The importance of higher-quality content is only increasing as the demand for content keeps rising. It’s hard enough to produce sufficient content; but standing out requires content on par with the highest-quality consumer publications (think Vanity Fair, Esquire, and Marie Claire). Writing, editing, and copywriting: Finding highly productive writers who are knowledgeable in a company’s field of expertise is no easy task. However, landing the right person can be a big boost to the impact of content on pipeline. Research: As buyers get smarter and content marketing matures, companies need to take on the role of publisher and analyst, providing high-quality content to more targeted audience segments. Primary research will facilitate that process. Creativity: Content marketers must continue to differentiate their content, using storytelling, humor, and other techniques to engage their audiences. Visual expertise: Another facet of creativity is using graphics and video to capture an audience’s attention, and to better communicate data and thought leadership. Subject-matter expertise: A good content marketer should be able to get great content from internal or external subject-matter experts (SMEs). Often, SMEs are internal and are interviewed by the content marketing team, because it’s not usually an efficient use of resources for SMEs to be writing all the time themselves. However, a content marketing team will boost its impact if its own writers have such knowledge as well: 7.9% of study participants indicated their desire to have SMEs on their team.